Caution! has only 2 drywers! Handsome planks of sturdy, wonderfully finished wood lend a balanced pastoral accent to your bedroom decor. Reminiscent of traditional styling with a transitional modern flair, this night stand has a compact size suited to any space and two drawers for storage options. Looks perfect in our rustic bedroom, and it matches well with the other furniture we have. It is a good size and the drawers slide in and out fine, however, there are only TWO drawers and not three as advertised....so was a little disappointed about that. I love it! It works perfectly with our existing rustic furniture. 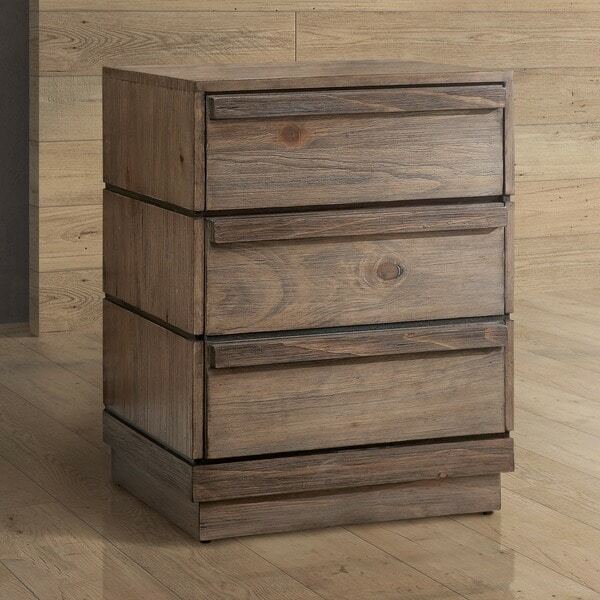 The only complaint/negative comment is that it lists it as a three-drawer nightstand. 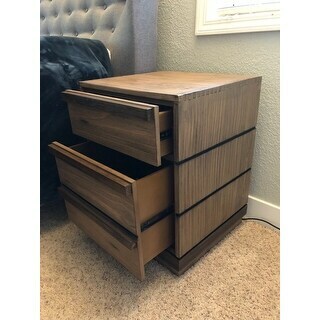 Please not that it is only a two-drawer nightstand where the bottom two handles open one big drawer. The drawers were crooked and couldn't even pull out. As soon as we pulled the other drawer out wood parts and screws fell out. On closer inspection the thing was nailed together crooked. The screws couldn't be fastened because the box sides weren't square so they left them loose. Nice deep drawers!! Solid build! I bought 2! Love this nightstand. It is very sturdy and good quality. Has a look that can be either rustic or rustic/modern. Really pleased with this purchase, which was a great price also. "Is any of this solid wood? The description doesn't say. Thanks." The nightstand is constructed with MDF. "Does this item come assembled?" Hello, this item does come assembled. Thank you. 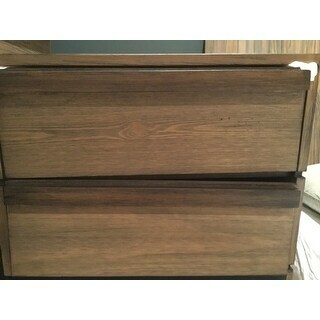 "what size are the drawer interiors ? thx"
The drawer dimensions are approximately 4.5 inches high x 16.5 inches wide x 13.5 inches deep.